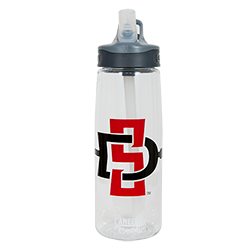 Sport bottle with integrated handle featuring the interlocking SD Spear logo. Flip, Bite-n-Sip valve. Simply flip stem up, bite and sip, no tilting required. Bottle is spill-proof, and has new improved Eddy hydration system with faster water and air flow. Dishwasher safe.